The Sustainable Water Partnership is proud to present Toolkit #1, a resource for working to improve water security. This is the first in a series of six toolkits which present an effective and efficient process to address water risks, including long-term water stresses that constrain social and economic development and sudden shocks that can quickly ruin the health and livelihoods of vulnerable populations. 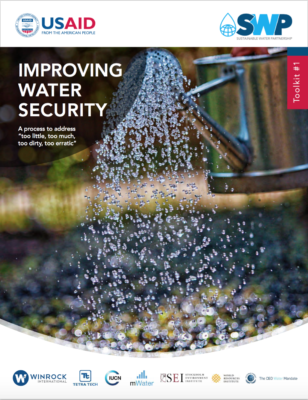 It provides a brief introduction to water security, as well as a detailed walkthrough of SWP’s five-step Water Security Improvement (WSI) process.